Harvey Block was demolished in connection with construction of the Aura II condominium November 10, 2011. Beltline Heritage Group (BHG) and Beltline Planning Group (BPG) had extensive discussions around whether our organization should, or should not, attempt to ‘defend’ this property. We found the building to be attractive and of historical value. Nevertheless, two factors diminish the heritage value of the site: (1) the fact that the story of the ‘Harvey’ after whom the building was named remains somewhat obscure, and (2) the reality that extensive earlier modifications to the building [particularly the addition of the ‘corner store’ unit and removal of the main floor windows] seriously undermine the architectural value of the property . 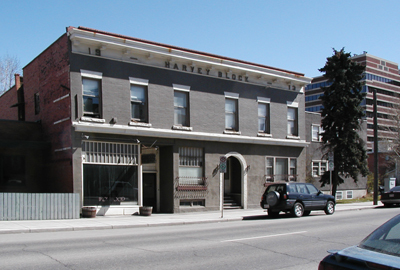 A few years ago, The Harvey Block was reviewed by the City of Calgary Heritage Authority as well as by the Beltline Heritage Inventory Project (B-HIP) and neither group recommended that this building be added to the City’s heritage inventory. There has been extensive redevelopment in Beltline over the past decade. Beltline helps maintain and upgrade Calgary’s largest heritage inventory while undertaking city-building in a contemporary urban style. This has added to the vibrancy and success of Beltline. Merchant John W. Chittick (1866-1945), who had earlier built the nearby Chittick Block (J.W.C. Block), constructed this typical two-story brick building in 1913 and named it for his son Harvey. The city’s booming economy crashed that year, but the Turner Valley oil boom the following spring brought a dramatic, albeit brief, recovery. 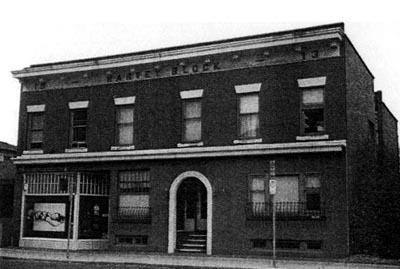 Calgarians bought oil shares as it they were going out of style, and a robbery in the Harvey Block caught the Albertan’s attention. “Ponoka Pete” was the newspaper’s characterization of the “bonehead burglar,” referring to the mental hospital in that central Alberta town. The thief broke into William McCoy’s apartment and stole cut glass, linen, and silverware, “but overlooked a nice fat bunch of oil stock certificates which might have put him on easy street for the rest of his life.” Fat chance. Within months the boom faded and many of those stock certificates became worthless, except as wallpaper. This small two-storey building, presumably developed in 1913 by an unknown Mr. Harvey, was owned by John W. Chittick, a dry goods merchant who possessed the revenue properties. The building represents the less affluent apartments that were erected in the Beltline area during this period. The building was subsequently adapted to provide a retail store on the ground floor, and was raised three feet this time so that suites could be constructed in the basement.